Perfect for the patio! 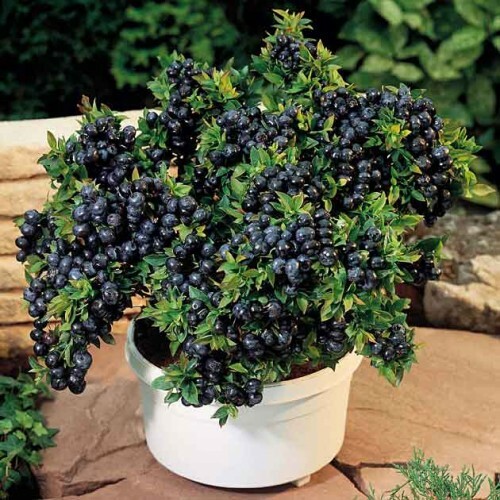 'Top Hat' is a dwarf variety that produces full-size, firm, flavourful, dusky blue fruit a with wild blueberry flavour. Just 2 feet tall, these little beauties have a lovely compact mounded shape which is loaded with white blossoms in the spring and red foliage in the fall. In late August you'll be rewarded with blueberries. Although blueberries are self-fertile, cross-pollination produces the best fruit crop so we recommend planting two and you'll notice bigger berries and larger crops. Blueberries do require acid soil - so it may be best to grow your blueberries in a container if your garden soil is not appropriate. Mulch with acidic peat, wood chippings or pine needles and water well.